Tabor Czech Days kicks off tomorrow night with the Bluebirds game, fireworks and carnival. We've been looking forward to it for quite a few weeks and it will be over too quickly, I'm sure. You can read a little on our experiences at the past couple of Czech Days celebrations as well as see a few layouts I've created to commemorate the event here , here (2006), here, and here (2007). I also wrote about the California camera crew that filmed in Tabor for a week surrounding the event thanks to Tabor native Aesli Grandi last year. Well, those hours of film turned into an hour long documentary called "Tabor: A Little Czech Town on the American Prairie" which was written and directed by Aesli. It is set to premiere at this year's celebration - running Thursday through Saturday at 6:00 p.m. and Sunday at 12:30 p.m. at Opsahl-Kostel Funeral Home. Aesli was younger than me, but I know her and her family well. 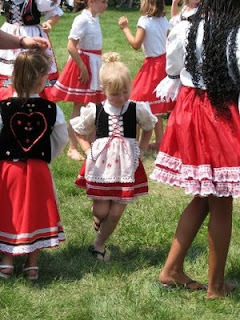 It was actually her mother that lent me the Czech Days outfit that Kaitlin wore to Czech Days when she was only 5 days old! If you clicked on the link above, you saw the pictures! It is so exciting to see someone from our tiny little town achieve so much at such a young age.